Auburn Lull have been silent for about 9 years, releasing some side project work and the occasional remix. 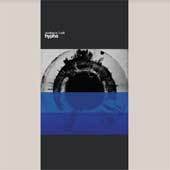 And now, suddenly, they are back with a new record, Hypha. I have been living with this record for a while, and i have to say that this is my least favorite Auburn Lull record. They are trying to move in a new direction, and i respect that. There are some songs on this record which point towards that new direction and are interesting and exciting, but the bulk of this record is transitional, neither the old dense drones that made up their previous work nor fully into the sparse ambiance that they are hinting at. So: Auburn Lull used to make music that was dense. Their songs were layers of guitar siding against one another, everything buried in echo and haze. The new direction is lighter, sparser, the dense clouds of sound pulled apart. The vocals also seem a not more prevalent than they used to. I am not so sure about this direction for the band. But then again, i really liked the older denser stuff. Maybe this will grow on me with time. I don't know. The record starts off with the very faint Juni. This is a haze of voices that slide around, before a good drone comes in. Eventually a drum kicks in, and the song sounds like Auburn Lull. After that minute or so at the end of Juni, the record seems to fade into thinness for a while. The drones are strange light things, not the massive density that Auburn Lull had used previously. And i find that the tracks tend to blur into one another. However, towards the end of the record things seem to change again. It is as if Auburn Lull have finally figured out this new, lighter sound. There is an amazingly beautiful track called Divaldlo pts. i, ii, iv. It starts with a minimal piano and drone tune that tinkles along in strange ways, with that great Auburn Lull thudding drumming in the background. The drone and the piano seem natural here, merging with that thick drumming. The sounds do not seem sparse or weak, just different. This is the first time on this record that it all really sounds like it belongs together. Not content to point towards a new sparsity with Divaldlo, the title track of the record features burbling electronics in the background, as Auburn Lull absorb what Autechre had to teach them, thus twisting their drones into something that is akin to Avrocar. They end the record with Mora/Mirage, all of the band singing Beach Boys harmonies over tinkling guitar and hushed drones. Divaldlo points the way forward. Much of this record was reaching to get there. Maybe it will grow on me in time, but right now it looks so weak and sparse compared to their other albums.